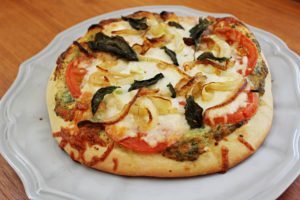 Did you know dietitians love pizza? We especially love having a pizza party. Well, okay, I can’t speak for the entire industry. But, this dietitian really loves pizza! I consider it one of my favorite foods, and that’s saying a lot. One of the things that I love about pizza is that it’s a great option to feed a group of people. A build-your-own pizza bar is an easy solution to keep everyone happy! 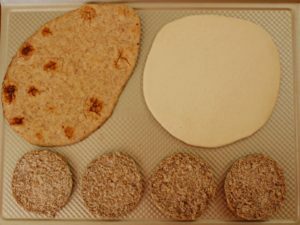 You can use naan, homemade pizza dough, store bough pizza dough, English muffins or bagels are the base for your pizza! The sky is the limit! 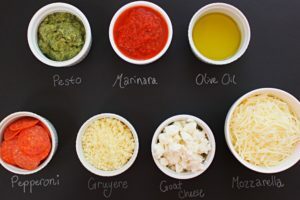 Have a variety of sauces to give people even more choices during the pizza party! Gotta have the classic marinara, but how about some pesto or even as simple as olive oil? 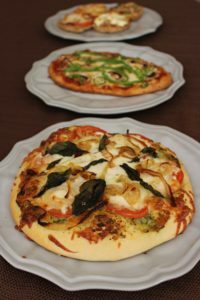 Trying different kinds of sauces and cheese can give your pizza a fun twist! In my opinion, the cheese is the best part, and I like to have options! Of course, you have the mozzarella. Then you can get fancy with some goat cheese, gruyere or swiss, gouda, parmesan…the more the merrier at my pizza party! Everyone has their favorite pizza protein, but pepperoni is a must in my book! You can also have some sausage, chicken, or ham! You can’t forget about the veggies! 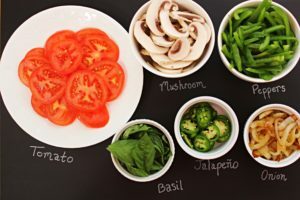 Mushroom, green pepper, onion, jalapeño slices, spinach or arugula, tomatoes…I want them all! Now the fun begins. Everyone gets to create their own masterpiece! Also, make sure the oven is preheating by now. You want a nice hot oven when you’re ready to bake! I usually go with 400 degrees F.
The anticipation is killing me! These pizzas look amazing! The Wait…IS IT READY YET?! The time is going to depend on your vessel…naan and english muffins are going to be about 7-10 minutes, and the dough will take about 12-15 minutes. You want golden brown crust and hot, bubbly cheese. Many people believe that pizza is off limits on a “healthy diet.” That’s not the case! Pizza can certainly be incorporated into a healthy lifestyle! 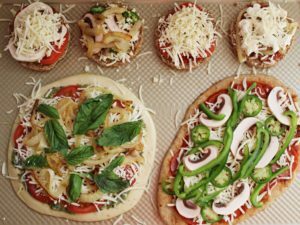 Next time you are feeding a group of people or want to get the kids involved in the cooking process, set up a pizza bar and get the creative juices flowing! Are You Following a Gluten Free Diet? No Worries! You Can Enjoy Pizza Too! What are your favorite ways to enjoy pizza? What about your favorite pizza toppings? Let us know if the comments below! Do you need help meal planning? Or maybe fitting in your favorite foods while still meeting your nutrition goals? Don’t worry! Make an appointment with one of our nutrition professionals, and we can help! Click here or call 301-474-2499.